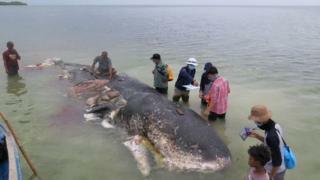 A dead sperm whale that washed ashore in a national park in Indonesia had nearly 6kg (13 lbs) of plastic waste in its stomach, park officials say. Items found included 115 drinking cups, four plastic bottles, 25 plastic bags and two flip-flops. The carcass of the 9.5m (31ft) mammal was found in waters near Kapota Island in the Wakatobi National Park late on Monday. The discovery has caused consternation among environmentalists. “Although we have not been able to deduce the cause of death, the facts that we see are truly awful,” said Dwi Suprapti, a marine species conservation co-ordinator at WWF Indonesia. In June, a pilot whale died off southern Thailand after swallowing 80 plastic bags. A report released earlier this year warned that the amount of plastic in the ocean could triple in a decade unless litter was curbed.